"So much changed. When there was a wedding in the family, for the first time I did my own shopping. I felt so good that I didn’t have to ask my father or bother," said Rukhsar happily. "She isn't married," chipped in Farah from another corner, intending to explain why Rukhsar mentioned 'father and brother', instead of husband. After all, traditionally it is the husband who takes care of a woman’s needs. Not that Farah’s husband has been a great help in that department. "Hardly anything is left to spend on me madam; after paying for the children’s school fees and ration for kitchen. My husband has a small income," Farah revealed, with extreme reluctance. She doesn’t like to share her story as it brings up bad memories. But today she is financially independent, and is proudly running her household. Rasheeda has three sons, one of whom has cerebral palsy and is paralysed from the waist down. She was born in Nizamuddin Basti and grew up making and selling needles at the Nizamuddin market. Today, she is a fine crochet artist with the Insha-e-Noor family, earning a salary of Rs 12,000 per month and supporting her son’s health care. The Royal Fort of Lahore is one of the extraordinary structures of its kind in the world. Located in the northwest corner of the walled city, the Fort is a mark of its earliest days. Roaming in the Lahore Fort you would listen the stories of love, adventure, beauties and attractiveness of queens and princesses in silk gowns and flowing dresses, Kings and Princes in armors and glittering crowns, warriors, slaves, soldiers, writers, poets, actors, revolutions, court intrigues and courtiers, courtesans, assassinations, castigation, coronations, and much more. Surely these tales would leave you breathless and mesmerised. At present the administration of the Lahore Fort is again documenting and studying the Sheesh Mahal in consultation with Aga Khan Trust for Culture so the building is conserved and prevented from other threats. The ‘Award of Merit’ given to Shahi Hammam under 2016’s UNESCO Asia-Pacific Awards for Cultural Heritage Conservation on September 1 was celebrated at a ceremony at the site in Lahore on Thursday. The work on Shahi Hammam was completed in June 2015. The main objectives of the conservation effort were to re-establish the monument as a bathhouse through the exposure, conservation and display of the remains of the original waterworks and drainage system through archaeological excavation, structural consolidation and restoration of the historic floor levels. Aga Khan Cultural Service Pakistan CEO Salman Beg said the project was undertaken with a high degree of technical proficiency. Published in The Express Tribune, November 25th, 2016. The internationally recognised Mughal Era’s Turkish bath site Shahi Hammam has turned out to be the first priority of international visitors and tourists. Statistics collected by The News revealed that since its inauguration in June 2016 as many as 5,000 international visitors and delegates had visited this site while over 50,000 local visitors including students, corporate entities and government functionaries had visited the site. The monument had recently received Award of Merit in this year’s Unesco Asia-Pacific Awards for Cultural Heritage Conservation. Walled City of Lahore Authority (WCLA) in collaboration with Agha Khan Trust for Culture and with financial support of Norwegian government carried out the conservation of this Mughal-era public bathhouse over a two-year period. Walled City of Lahore Authority officials said the primary objectives of the conservation effort were to reestablish the monument as a bathhouse through the exposure, conservation and display of the remains of the original waterworks, drainage and hypocaust system through archaeological excavation, structural consolidation and restoration of the historic floor levels. The main reason why international tourists prefer visiting Shahi Hammam is presence of some other very important historical monuments nearby such as Delhi Gate, Masjid Wazir Khan, Well of Dina Nath and rehabilitated and restored Shahi Guzargah. The visitors can also witness original city life while touring this area. Nisar Ahmed, a local shopkeeper, said after conservation business activities in this area have flourished. “I am a seller of handmade mud toys and prior to the conservation and restoration of this area, I was living hand to mouth but now I am earning good as well as my children are also going to school,” he added. On Thursday (today), WCLA has planned a colorful ceremony to commemorate the Award of Merit during which a plaque will be unveiled by Counsellor Royal Norwegian Embassy (RNE) Arne Haug and DG Walled City of Lahore Authority (WCLA) Kamran Lashari, in the presence of CEO Aga Khan Cultural Service Pakistan (AKCSP) Salman Beg, as well as representatives of the Aga Khan Trust for Culture (AKTC) conservation team that worked on the project. Tanya Qureshi, media manager of WCLA, said the Unesco Asia-Pacific Awards for Cultural Heritage Conservation programme recognised the efforts of private individuals and organisations that have successfully restored and conserved structures and buildings of heritage value in the region. A total of 13 winning projects from six countries – Australia, China, India, Iran, Japan and Pakistan – have been recognised in this year’s Heritage Awards, she said, adding a panel of international conservation experts met in Bangkok to review the 40 Heritage Awards entries. Salman Beg, CEO Aga Khan Cultural Service Pakistan, said the project has been undertaken with a high degree of technical proficiency and the restoration of Shahi Hammam has safeguarded a unique example of the 17th-century Mughal public bathhouse monument. The team of international and local experts and artisans adeptly addressed the issues of significant structural damage and loss of fabric resulting from inappropriate alterations, poor conservation work and encroachments, he said. He added that careful investigation and analysis were done for the conservation, including architectural consolidation and the preservation of frescos and other decorative elements. Senior Architect, Rashid Makhdum, said Shahi Hammam was the first example of a monument conservation of its kind in Punjab and was the evidence of the success of the partnership between AKCSP and Walled City of Lahore Authority. The project has also paved the way for similar monumental conservation in other parts of the Walled City, like the rehabilitation of the Chowk Wazir Khan and preparatory documentation of the UNESCO World Heritage Site of the Lahore Fort as both these projects are being carried out with financial assistance from the US and Norwegian Embassies in Pakistan, he maintained. DG WCLA, Kamran Lashari, said that the Hammam has now been established as a heritage museum-site that welcomes tourists and visitors from all over the world into the Walled City and is kept alive as a venue for talks, seminars and cultural and corporate events. “Since its opening, the Hammam has been visited by thousands of local as well as international visitors and is increasingly becoming the centre piece of tourism in the Walled City,” he said. AKTC Involvement in "The treasures saved from Palmira"
The next step, which, according to sources close to Abdulkarim, is the signing of a reconstruction agreement between the General Directorate, the Aga Khan Trust for Culture (sponsored by the agahan, Ismaili spiritual leader, dedicated to the rescue and Preservation of Islamic heritage around the world), Unesco and possibly the governments of the European Union, the United States and Russia. Sources of the negotiations believe that the agreement could be signed before the end of the year, although the return of factions of the IE to the environs of Palmira may call into question the deadlines. Wu Man is probably the greatest player of the Chinese pipa, a sculptural-looking lute that dates back 2,000 years and is frequently played by angels in ancient Buddhist frescoes. Dressed strikingly in turquoise, Wu Man played two solo pieces to open this concert. Delicate and intricate, they brilliantly demonstrated her technique with lyrical melodies, dramatic tremolos and percussive snaps. But this concert, presented by the Aga Khan Music initiative, was titled “Old and New Music from the Ends of the Silk Route” and Wu Man was joined by three Syrian musicians on saxophones, qanun zither and vocals plus Andrea Piccioni on frame drums. Most of the music wasn’t traditional, but newly composed by sax player Basel Rajoub. So Gypsy Home featured a beguiling web of plucked strings on the pipa and qanun (played by Feras Charestan) with Rajoub adding Jan Garbarek-like decorations. The soft, beautifully focused vocals of Lynn Adib brought a welcome warmth and some brilliant scatting in the final numbers. We needed more of that excitement. While there was lively interaction between the musicians, the pieces were predominantly slow, introspective and lacking in fire. It was only towards the end that all the musicians played together and realised the excitement of what could be a really creative combination. NEW DELHI: The profile of Humayun's Tomb has been enhanced. Nearly a dozen other garden tombs in the vicinity of the grand 16th-century Mughal edifice have also been designated as monuments of outstanding universal value by Unesco and recognised as world heritage. In 2015, one the request of Aga Khan Trust for Culture and Archaeological Survey of India, Unesco included Isa Khan's Tomb, Bu Halima's Tomb and Garden, Afsarwala Garden Tomb and Arab Serai Bazaar as part of the world heritage site. In early this year, AKTC proposed further boundary modification, wh- ich was forwarded by the Centre to Unesco. ASI and AKTC made a case to Unesco that the integrity of Humayun's Tomb would be compromised without the inclusion of these structures. "Each of these monuments continue the predominant architectural feature of red-white contrast developed at Humayun's Tomb, though the Mughals used lime plaster mixed with marble dust to mimic the more expensive white marble used at Humayun's Tomb," said a conservationist. Minister for Municipal Administration and Urban Development K.T. Rama Rao said that the government would strive to get Unesco World Heritage Site status for the Qutb Shahi tombs complex and Golconda fort. “We will take all steps possible to make it happen. If budgetary support is needed, we will pitch in with that as well,” he said, presiding over the completion ceremony of Badi Baoli, inside the tombs complex. The Badi Baoli is one of the biggest heritage step wells in Hyderabad and has been painstakingly restored as part of the conservation effort led by Aga Khan Trust for Culture (AKTC) aided by Tata Trusts and backed by Telangana Department of Archaeology and Museums. Aga Khan’s Music Initiative is where cultures combine in harmony and produce music that crosses borders and touches hearts. Witness the fusion of various cultures as instruments play in unison to give you one memorable evening. From Afghanistan to South Africa, Asia to Europe, artists come together to combine sounds and instruments that will result in nothing but a musical wonder. Asia Society presents a staging by Aga Khan Music Initiative’s All-Stars Ensemble on the theme of “New Music from the Ends of the Silk Route”. This six-artist line up brings together some of AKMI’s most beloved artists-performers from Afghanistan, China, Italy and Syria- for a performance arranged for a unique combination of instruments which represent the Eastern and Western ends of the historical Silk Route as well as ancient and contemporary musical cultures. These include the pipa, an instrument introduced to China in ancient times that originated in Central Asia; qanun, a core member of any Arabic taht; Afghan rubab, considered the national instrument of Afghanistan but also used among Kabuli musicians to perform Indian classical music; tabla, the best known Indian percussion instrument; a variety of frame drums, one of the most ubiquitous instruments in the Muslim world; and saxophone, a European invention that has become a universal instrument used by musicians from South India to South Africa to perform myriad forms of traditional, fusion and contemporary music. Be a part of this musical journey at The Royal Opera House that holds a glorious past for the music in this city. Bombay was in its glory days in the 1900’s, and at its peak of social, artistic and cultural dynamism. An integral part of this movement was the Royal Opera House Mumbai, first inaugurated by King George V in 1911. It still holds relevance and reverence in the cultural fabric of contemporary Mumbai, and is in fact India's only surviving opera house till date. One of the last standing Baroque buildings in Mumbai today, the Royal Opera House Mumbai, with its long standing association with art, literature, theatre and music and has hosted Operas and live performance of artists like Bal Gandharva, Prithviraj Kapoor, Dinanath Mangeshkar and Lata Mangeshkar. The Aga Khan Music Initiative Ensemble presents a rare artistic encounter that both celebrates and reimagines time-honoured musical meetings as the Initiative’s leading artists perform a newly-created repertoire of compositions, improvisations and contemporary arrangements inspired by tradition. This group of music innovators demonstrates the transmission of ancient musical traditions to a talented generation of performers who are developing them in new directions, exemplifying musical creativity that has historically been inspired by the meeting of cultures. This six-artist line up brings together some of AKMI’s most beloved artists-performers from Afghanistan, China, Italy and Syria- for a performance arranged for a unique combination of instruments which represent the Eastern and Western ends of the historical Silk Route as well as ancient and contemporary musical cultures. These include the pipa, an instrument introduced to China in ancient times that originated in Central Asia; qanun, a core member of any Arabic taht; Afghan rubab, considered the national instrument of Afghanistan but also used among Kabuli musicians to perform Indian classical music; tabla, the best known Indian percussion instrument; a variety of frame drums, one of the most ubiquitous instruments in the Muslim world; and saxophone, a European invention that has become a universal instrument used by musicians from South India to South Africa to perform myriad forms of traditional, fusion and contemporary music. AIMIM Floor Leader Akbaruddin Owaisi visited Qutub Shahi tombs and took up detailed inspection of ongoing conservation work. LAHORE: Following the removal of encroachments and completion of its reservation work by the Walled City of Lahore Authority (WCLA), Chowk Wazir Khan is once again ready to amaze tourists with its new expanded and encroachment-free look. For the past three decades, Chowk Masjid Wazir Khan was facing heavy encroachments especially shops, which were rented out on nominal rates. However, the WCLA initiated the project of rehabilitation, restoration and renovation of this historic chowk. Officials said the historic forecourt adjoining the Wazir Khan Mosque has been undergoing a thorough rehabilitation and conservation effort since October 1, 2015, funded by the US embassy, and is in its final stage of preparation for its opening on March 16. [i]Intention of conservation works is to ensure that significance of the site is preserved and that its architectural integrity is maintained. Hyderabad: The German Federal Foreign Office (GFFO) will support the Aga Khan Trust for Culture in conserving three domed tombs in the Qutb Shahi Heritage Park. The domes, known as Commander and the twin tombs of two ‘hakims’, will be restored at an estimated cost of Rs 55.6 lakh, which will be donated by GFFO. “The project which began in 2013 will be completed in 2023. The money is being donated from the cultural conservation fund of GFFO,” said Ratish Nanda of the Aga Khan Trust for Culture. Lisbon, 2 April 2013 – As part of a week-long programmes celebrating Nowruz, musicians from the Silk Route performing with the Aga Khan Music Initiative (AKMI) presented a specially curated concert programme in the Senate Room of the Portuguese Parliament. Nowruz marks the beginning of Spring, which is a cherished holiday in the Silk Route region. A second concert was performed at the Ismaili Centre in Lisbon on the 27th of March. The performances included artists from the Badakhshan Ensemble (Tajikistan), classical and folk music from Iran, as well as instrumental and festive music from Tajikistan and Uzbekistan, as well as a number of other artists. The event was open to the public. Jointly sponsored by the Committee of Foreign Affairs of the Assembly of the Republic (CoFA) under the direction of President Dr. Alberto Martins, the Aga Khan Development Network (AKDN) and the Aga Khan Music Initiative (AKMI), the performance was part of the Aga Khan Music Initiative’s week-long programme entitled Celebrations of Nowruz. In addition to the concerts in Lisbon, several concert performances, lecture-demonstrations, film screenings and master classes were presented at the Théâtre de la Ville (Paris) on 23 and 24 March, the Scène Nationale d’Orléans (Orléans) on 26 March and at the Cité de la Musique, Marseille, on 27 and 29 March. The programme, called Music and Voices of the Silk Route, was designed to present audiences with a broad perspective on the richness and diversity of the artistic traditions of the region. The concerts showcased new talents and offered an introduction to the tradition of celebrating the region’s most beloved holiday, Nowruz. Nowruz, or literally “the new day”, marks both the beginning of spring and of the New Year for many Muslim communities in Iran, Afghanistan, Central Asia and elsewhere. It is celebrated on the day of the March equinox, which usually occurs on March 21 or on the previous or following day, depending on where it is observed. The Aga Khan Music Initiative is an interregional music and arts education program with worldwide performance, outreach, mentoring, and artistic production activities. The Initiative was launched by His Highness the Aga Khan to support talented musicians and music educators working to preserve, transmit, and further develop their musical heritage in contemporary forms. Music Initiative began its work in Central Asia, subsequently expanding its cultural development activities to include artistic communities and audiences in the Middle East, North Africa, and South Asia. AKMI designs and implements a country-specific set of activities for each country into which it invests and works to promote revitalization of cultural heritage both as a source of livelihood for musicians and as a means to strengthen pluralism in nations where it is challenged by social, political, and economic constraints. North America’s largest Islamic-inspired garden is to be built in Alberta, a $25 million gift from the Aga Khan that is expected to attract up to 160,000 visitors a year. 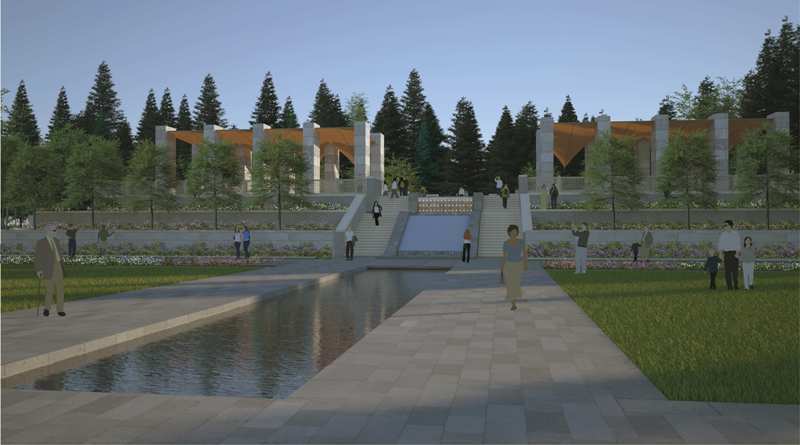 Spanning almost 12 acres, the Mughal garden will become the centrepiece of the sprawling 240-acre University of Alberta Botanic Garden, located about 15 minutes southwest of the city. Design work on the project began about six years ago after the Aga Khan, the spiritual leader of the Shia Ismaili Muslims, visited the garden and suggested the idea. Early stages of construction began in the summer of 2016 and the new garden is scheduled to open in time for the Aga Khan’s diamond jubilee celebrations in July 2018. The University of Alberta is predicting that the Aga Khan Garden could increase attendance from between 60,000 to 70,000 annually to about 160,000. An overview of the Aga Khan Garden. So, at the behest of the Aga Khan, Woltz spent a year travelling to similar Islamic gardens around the world to undertake extensive research and to study their form and design. “That trip is what helped us avoid the sense we were making some historical quotation without a deeper understanding of space, form, scale and what the garden would be made of,” he said. The Aga Khan Garden amphitheatre. “The challenge here is how do you have a contemporary interpretation of an Islamic garden that has many of the features we discovered in our research without it reading as a reproduction or anything artificial. The dominant feature of the garden will be 16 covered, 18-foot high stone columns at the top of the garden designed to provide shade in the summer and offer some protection from the elements for visitors in the winter. Stairs will lead down to a large central courtyard, known as a chahar bagh, which is divided by walkways into four grassed areas and surrounded by native plants. The view looking back up to the top of the Aga Khan garden from the bustan. On the edge of the chahar bagh will be a terrace floating in a tank of water that links to the Calla Pond that creates a separation between the formal and informal garden. Flanking the water on either side orchards, or bustans, made up of local fruit trees including apples and cherries, will be dotted around ribbons of walkways. Woltz said the movement of water around the site led designers to realize that some of the area could be dedicated to native plants and fruit trees. “Mughal gardens are often thought of as vast pleasure gardens with ornamental shrubs and water features but in our research we realized that the roots of all of the formal language is actually in agriculture,” he said. Behind the main courtyard will be a wooded walkway, known as the woodland bagh and an open-air amphitheatre. Traditionally in warmer climates large date palms, olive trees and pomegranate would dominate the garden however the designers opted for more temperate-friendly trees like aspens, cedars and spruce. Those plants and trees missing from the garden because of the incompatible climates will appear in relief carvings on the massive stone pillars, Woltz said. “But the garden from the beginning was not intended to be a garden about faith or religion,” he said. “The Mughal garden tradition is rooted in agriculture, the pavilions were really more for retreat, meditation, study and pleasure. There was no mandate from his highness to be a religious space or a religious garden. The look from the top of the Aga Khan garden to the lake and the bustan. Dean of Faculty of Agricultural, Life and Environmental Sciences, Stan Blade, said the rest of the facility will remain open during construction meaning people can still visit sites like the Alpine Garden, Japanese Garden and the Native People’s Garden. Blade said once complete they expected attendance to balloon from between 60,000 and 70,000 annual visitors to 160,000. This project is a continuation of a decade-long relationship between the University of Alberta and the Aga Khan. In 2006, the university signed a memorandum of understanding with the Aga Khan University and three years later, the Aga Khan was awarded an honorary doctor of law degree. “This fits nicely into the overall idea of beauty, of culture, of diversity that people are going to be able to experience,” Blade said. That increased attendance will mean the university will likely have to hire new people to maintain the garden and to be part of their interpretative programs. Currently there is about 25 to 30 permanent staff and an additional 50 to 60 seasonal staff members. “The current garden is beautiful… but when you look at this kind of opportunity, we are quite confident that this becomes a destination opportunity. Edmonton, 7 April 2017 — Details of an Islamic garden gifted by Mawlana Hazar Imam to the University of Alberta were revealed today at a special ceremony. The event also included the signing of a memorandum of understanding between the University of Alberta and the Aga Khan University. When it opens in 2018, the spectacular new Aga Khan Garden, Alberta will feature “stepped terraces that change with the seasons, geometric water features that stream into wetlands and a spectacular orchard of local plants,” according to a jointly issued press release from the University of Alberta and the Aga Khan University. It will occupy 4.8 hectares within the University of Alberta Botanic Garden, offering opportunities for research and learning. “On the 150th anniversary of Canada, it is appropriate that we are creating together a Mughal-style garden, which echoes the great contributions that Muslims have made to world heritage,” said Mawlana Hazar Imam in a written statement. The gift celebrates both Canada’s sesquicentennial and Hazar Imam’s Diamond Jubilee, which commences on 11 July 2017 and marks 60 years since he inherited the Ismaili Imamat. The project’s development has been led by the Aga Khan Trust for Culture in collaboration with the University of Alberta and the Aga Khan University. Award-winning firm Nelson Byrd Woltz Landscape Architects was commissioned in 2010 to design the garden. The ceremony was also attended by University of Alberta President David Turpin and Aga Khan University President Firoz Rasul. Together they signed a new memorandum of understanding that builds on previous agreements between the institutions signed in 2006 and 2009. The Aga Khan Garden honours the longstanding partnership between the two institutions, which has resulted in collaborations in teaching and training missions, postgraduate studies and internships in a variety of fields. The gift of an Islamic garden was first announced by Mawlana Hazar Imam during his address at a University of Alberta convocation in June 2009. The Aga Khan Garden joins the Aga Khan Park in Toronto, becoming Mawlana Hazar Imam’s second landscape project in North America and the 11th in the world to be built by the Aga Khan Trust for Culture. When it is completed, Edmonton will join cities like Bamako, Cairo, Delhi, Kabul, and Toronto that each host parks and gardens that were conceived or rehabilitated by the Aga Khan Trust for Culture as catalysts for positive economic, social and cultural change. One might think it unlikely to find a Mughal-inspired garden north of the 53rd parallel, especially in a city known as Canada’s “Gateway to the North”. But that will soon change. The newly revealed Aga Khan Garden in Edmonton is to be the northernmost Islamic garden in the world. Announced as a gift by Mawlana Hazar Imam during his address at a University of Alberta convocation in June 2009, it is to be situated within the university’s Botanic Garden. The Aga Khan Garden, Alberta is a symbol of the ongoing partnership between the University of Alberta and the Aga Khan Development Network—a collaboration that has fostered intellectual, cultural and education exchange for over a decade. The University of Alberta is grateful to His Highness the Aga Khan for a gift in excess of $25 million that has made this spectacular new garden possible. “People were living here till a few days ago. Then Mukhtiar Nizam asked us to restore this place as pieces of the dome were flaking off. We began clearing and cleaning it up only a month back,” says Ratish Nanda of the Aga Khan Trust for Culture (AKTC). The AKTC, which has restored the Humayun’s Tomb complex as well as the Jamaat Khana Masjid, one of the oldest in Delhi and built during Alauddin Khilji’s time, has been entrusted the task of conserving the monument. new garden will bloom in 2018 at the University of Alberta Botanic Garden. His Highness the Aga Khan, Chairman of the Aga Khan Development Network (AKDN) and spiritual leader of the Ismaili Muslim community, has made a contribution in excess of $25 million for the Aga Khan Garden in Alberta. The gift arises from the long-standing relationship between the University of Alberta and the Aga Khan, highlighted by a Memorandum of Understanding first signed with the Aga Khan University in 2006 and an honorary doctorate given to His Highness in 2009. Thomas Woltz, of award-winning Nelson Byrd Woltz Landscape Architects, was asked by the Aga Khan to study other Mughal Islamic gardens while developing a design that also incorporates the plants and topography of Northern Alberta. With secluded forest paths, wide, stepped terraces that change with the seasons, geometric water features that stream into wetlands and a spectacular orchard of local plants, the 4.8-hectare Aga Khan Garden will be an amazing experience for area residents and visitors alike. It will be situated around the existing Calla Pond at the heart of the University of Alberta Botanic Garden. The Aga Khan Garden is the first garden in Western Canada, the second in North America, and the 11th in the world to be supported by His Highness. The addition of the new Aga Khan Garden is expected to increase the number of annual visitors to the University of Alberta Botanic Garden from 75,000 to 160,000. An interpretive program will help visitors understand the featured plants and the art and design of the garden. Information about Islamic traditions, music, sound and poetry will also be provided. Jaipur, India, January 2017 - Musical artists from the countries along the fabled Silk Route came together to perform as the Aga Khan Ensemble at the Hotel Clarks Amer on the 22nd and 23rd of January. The performance, which was a part of the ZEE Jaipur Literature Festival, is the result of a pioneering initiative of the Aga Khan Music Initiative, with support from the Aga Khan Foundation. The Aga Khan Ensemble is a collective of master musicians who create new music inspired by their own deep roots in the cultural heritage of the Middle East and Mediterranean Basin, South Asia, Central Asia, West Africa, and China. These master musicians are the Aga Khan Music Initiative’s leading artistic collaborators—venerated performers and composer-arrangers who appear on the world’s most prestigious stages while also serving as teachers, mentors and curators who enrich the Music Initiative’s interregional network of education programmes. Linking countries and continents, and present and past through explorations of diverse forms of classical, folk, jazz, and contemporary concert music, the ensemble contributes strongly to the Music Initiative’s mission to invigorate cultural and intellectual pluralism in the nations it serves. In forging this contribution, the Aga Khan Ensemble brings to life a new body of artistic work that is at once seamless, surprising, and exuberantly original. The January performance continues and solidifies the partnership between the Aga Khan Music Initiative and the ZEE Jaipur Literature Festival (established in 2015). The partnership, which is supported by the Aga Khan Foundation, is committed to presenting a new body of music by the master artists that form the Aga Khan Music Initiative roster. Besides performances at ZEE Jaipur, the Aga Khan Ensemble presented its new repertoire at the Aga Khan Academy in Hyderabad on the on the 25th of January and Mumbai’s Royal Opera House on the 28th of January. AGA KHAN ENSEMBLE AT SERRALVES, OPORTO. The newly restored Wazir Khan Chowk, the historic forecourt adjoining the Wazir Khan Mosque, will open by March-end, according to Aga Khan Cultural Service Pakistan CEO Salman Beg. The restoration of this historical cultural space was undertaken by the AKCSP in collaboration with the Walled City of Lahore Authority (WCLA) and has been funded by the US Ambassador’s Fund for Cultural Preservation. In recent years, the Wazir Khan Chowk has been choked by encroachments of makeshift commercial outlets. The rehabilitation and conservation process of Wazir Khan Chowk began on October 1, 2015. “The open space has been run over by retail shacks, girded by corrugated steel and thronged by citizens, employing it as a market. As a result, the Shahi Guzargah has lost its only area of respite amidst the narrow trail full of commuters in quick transit,” the AKCSP chief pointed out. The University of Alberta Aga Khan Garden will serve as a living reminder of the diverse heritage of our open and welcoming province, which is a big part of what makes Alberta such a great place to live. The Aga Khan Garden, Alberta was made possible by a contribution in excess of $25 million by His Highness the Aga Khan, Chairman of the Aga Khan Development Network (AKDN) and spiritual leader of the Ismaili Muslim community. The gift arises from the long-standing relationship between the University of Alberta and the Aga Khan, highlighted by a Memorandum of Understanding first signed with the Aga Khan University in 2006 and an honorary doctorate given to His Highness in 2009. AKTC provide technical support to a project of national pride in Afghanistan. KABUL, Afghanistan — Nothing symbolizes the wrack and ruin of Afghanistan and its four decades of war better than Darulaman Palace, a once-magnificent edifice visible on its hillock perch for miles around. The palace has been pummeled and pockmarked by every conceivable caliber of weapon fired by nearly every faction in the country’s recent wars, with the possible exception of the Americans and their allies, because it was too damaged by the time they arrived to provide much useful cover. Yet, like Afghanistan itself, the palace never quite totally collapsed, its four domed towers still in place, although the building beneath was so ruined it seemingly defied gravity. That is especially true, she said, because it is being done by Afghans themselves. “It is so good that we have been able to find the capacity in ourselves for this,” she said. “Selfies are good,” says Ratish Nanda as we make our way up impossibly steep and winding stairs to the top of Abdur Rahim Khan-I-Khanan’s tomb in New Delhi’s Nizamuddin East residential area. I almost miss a step in surprise as selfies are the new bane of our times. But as the India head of the Aga Khan Trust for Culture, charged with conserving monuments such as this tomb and, earlier, Humayun’s magnificent mausoleum, Nanda has a different take. Selfies have replaced graffiti as the visitors’ preferred mark of presence! The painstaking work of saving the tomb of Rahim, the amazing soldier-poet “step-son” of Emperor Akbar-famed for his dohas-from crumbling fulfills all the criteria for MNREGA, including creating an economic asset. It is, after all, already providing jobs and honing skills. Its unique design lends Najaf Khan’s Tomb a surreal quality matched by its luxuriant lawns. What if Humayun’s Tomb didn’t have a dome — just the stone plinth on which it stands? To see what it would look like, just head to Najaf Khan’s Tomb in central Delhi. This monument is more curious than most. There is nothing here except for a stone platform surrounded by trimmed lawns and centuries-old stone walls. Two marble cenotaphs sit atop the plinth. Where’s the dome? It looks like someone took it away. Conservation architect Ratish Nanda of the Aga Khan Foundation, the man behind the restoration of Humayun’s Tomb, says that there was no dome to begin with. He calls it an ‘open tomb’ and says that Delhi has other such memorials with cenotaphs looking to the sky. “Najaf Khan’s open tomb is noted for its grandeur because it is surrounded by a very well-kept garden,” he says. A Persian noble, Najaf Khan served at the courts of the later Mughal emperors. He also founded a Delhi neighbourhood (hint: it’s named after the founder and famous for producing one Virender Sehwag). The Mosque Wazir Khan was built in 1634-35. Lahore: Mosque Wazir Khan, built in 1634-35 by Hakim Ilmuddin, in the era of Mughal emperor Shah Jahan, is popular with tourists, historians and students. But for 60-year-old Shaikh Alauddin it is part of his life. As a toddler he started going to this mosque near his home and even today he prays there five times daily. Shaikh, who runs a shop selling imported suitcases and bags in front of Wazir Khan Mosque, appreciates the efforts made by Walled City Lahore Authority to restore the mosque’s glorious structure. “We have spent our childhood watching this glorious mosque. The conservation which is being done at the mosque is remarkable and the process must continue,” Shaikh says. “This beautiful sight of Mosque Wazir Khan Chowk that we see today was not there. The whole area had been encroached upon. There were illegally constructed shops along the northern wall of the mosque. There used to be a well in the courtyard, which has now been closed,” he adds. The royal trail starts from Delhi Gate near the mosque. The royal trail is the cleared part of the walled city and has many historical buildings on it. The mosque’s traditional chowk (courtyard) in front has been completely restored. The recent conservation of the outer wall, and the northern wall façade has started attracting tourists. Mukhtar Ahmad, 42, is a rangela (decorated) rickshaw driver. He takes visitors to the sites along the Royal Trail starting from Dehli Gate. He charges Rs1,500 (Dh86) for a tour with a family or groups of tourists. “I got this job due to this recent conservation work. More people would visit when this sultry and humid weather of monsoon is over. When guides are not available I provide the information to local and foreign tourists. I can speak English, but in my own Punjabi style,” Mukhtar sAys while narrating some facts about the Delhi Gate and Mosque Wazir Khan in rudimentary English enunciated in his Punjabi accent. Rashid Makhdum, senior architect and consultant, Aga Khan Cultural Service Pakistan, says the PC-1 (Project plan of five years) of the conservation of Mosque Wazir Khan was approved in March this year. “We have renovated the chowk in front of mosque and it gives a beautiful view to tourists,” he says. He has been associated with the Aga Khan Trust for Culture Pakistan more than 10 years. “Renovating and conservation is a daunting task for sure as we are confronted with the presence of houses constructed on the southern wall of mosque Wazir Khan. This not a good sign as people live in these houses,” Rashid said. “We will clear the view and restore southern wall of the mosque and other old-architecture which is present around the mosque by the end of this year, he said. “Conservation of the northern façade of the Wazir Khan Mosque by the Aga Khan Cultural Service Pakistan with support from the Royal Norwegian Embassy and Aga Khan Trust for Culture in collaboration with the Walled City of Lahore Authority was completed last year,” Lashari said. The encroachments of illegally built steel shops on the front side of the Wazir Khan Mosque were removed before the conservation work was started. The mosque is famous for its kashikari, a glazed-tile mosaic work which makes this mosque unique among cultural monuments. Lashari said rehabilitation of the northern façade and the adaptive reuse of its hujras, or rooms, for the sale of traditional handicrafts would form a template for the conservation of the entire mosque. Covering an area of 279 x 159 feet, the mosque is entirely constructed in cut and dressed bricks laid in kankar lime with a scanty sprinkling of red sandstone in the gate and the transept, according to the Agha Khan Trust. The courtyard is divided into two parts. The upper part is about two metres higher. The courtyard is flanked on its east, north and south sides by 32 small hujras (rooms) of different sizes. "The effort of Aga Khan Trust for Culture and Telangana Tourism is to restore the Tombs to how they were nearly 500 years ago," Telangana Tourism secretary Venkatesham said. After a meeting with AKTC Director General Luis Monreal and other senior officials from the Trust here, Venkatesham said the State government was extending all support to the Trust for restoration and protection of the priceless heritage. The AKTC, which had already restored the Humayun Tomb complex at Delhi, has taken up the Qutb Shahi Tomb complex restoration with its own budget of Rs.100 crore while the department of Tourism, Culture and Archaeology is pooling in another Rs.100 crore, he said. “The effort of Aga Khan Trust for Culture and Telangana Tourism is to restore the Tombs to how they were nearly 500 years ago,” Venkatesham said. The Tombs complex have several unique aspects and have well planned gardens and fountains, he added. LAHORE: He gets up in the wee hours of the morning to say Fajar prayers at the glorious Wazir Khan Mosque located near Delhi Gate of the Walled City. This routine Asghar Ali has continued throughout his life for more than five decades. During the day too he comes he runs his shop near the mosque and ends his day after offering Isha prayers at the same mosque. Asghar, who lives in the vicinity of the mosque, says for many people the mosque may be a tourist attraction but for him it is part of his life. "My grandparents came here from India after the partition of Subcontinent. Since then my family has been living here. Everyday many people including foreigners to visit Wazir Khan Mosque,” he said. ‘A mole on the cheek of Lahore’, as art lovers call it, Masjid Wazir Khan is a world wonder. It was built in 1634-35 A.D. during the reign of Mughal Emperor Shah Jahan by Ilam-ud-Din Ansari, commonly known as Wazir Khan, who was governor of Lahore till 1639 A.D. The mosque was completed in about seven years. Colourful ceramics and plaster have been used. Persian art can be seen everywhere in the mosque. The mosque’s walls are almost completely suffused with detailed embellishment of kashi kari (tile mosaic), fresco painting, stone and chuna (lime plaster) decoration, and taza kari (brick outline fresco) on both the exterior and interior surfaces. The entire floor is built in cut and dressed small brick work laid in some 13 patterns. Wazir Khan Mosque has been under the extensive restoration since 2009 under the direction of Agha Khan Trust for Culture with the contribution of Government of Punjab. The restoration project included bringing the Chowk Wazir Khan to its original form by digging 2.5 meters to separate the existing street level and the original ground level of the forecourt of the Chowk through archaeological excavations. A retaining wall was built to avoid future encroachments and to ensure a protective bulwark for the hujras. The total area is 383 km to Chowk Wazir Khan and they restored 57 streets with in the duration of 9-10 months and only the front area is renovated by the organizations. Next plan is to restore the area from Masjid Wazir Khan to Akbari gate. An appropriate and effective system of display will be designed and implemented in its historic context. The urban design and rehabilitation of Chowk Wazir Khan will be integrated with the conservation design of the mosque. The authority of Walled City aims to preserve the rich ornamentation of tile mosaic, Fresco painting and brick imitation work which is going to attract local and foreign tourists. Walled City Lahore Authority Deputy Director Tania Qureshi said that so far the restoration process of Royal Trail from Chowk Kotwali to Masti Gate is in process. This is the second phase of the Royal Trail and 1st phase i.e. Delhi Gate to Chowk Kotwali was completed in 2015. In this restoration process we are improving the facade of all the buildings on the route. Recently Chowk Wazir Khan has been conserved and is now open for public gatherings and events. This year the Independence Day festival was organized at Chowk Wazir Khan for the residents of the walled city." "The conservation and restoration of Wazir Khan Mosque in a five years plan. So far the PC-1 of the Mosque has been prepared by WCLA and after its approval the work will start depending upon the releasing of budgets." she further said. It may be gorgeous on the inside, but the entry to the University of Alberta Botanic Garden is looking a little, well, old and worn out. That won't be the case for much longer thanks to the $4.9-million overhaul currently underway. "As someone once said, your curb appeal is that of a minimum security prison," laughed garden director Lee Foote. But with winter quickly closing in, construction crews are now racing to get as much work as possible done at the gardens, including the reconfiguration and repaving of the parking facilities, work that will increase capacity to 600 cars from 210, Foote said. "We've had this rather archaic and frankly, slightly dangerous, parking lot for the last 35 years," he said. "We've needed this for some time." The $4.9 million in funding will not only be used to spruce up the parking lot, it will fund various other base garden infrastructure system upgrades including waste water and treatment and site sewage development, power, water and gas, roadway and basic lighting as well as plaza development. Foote said the log cabin that has greeted tens of thousands of visitors over the past 35 years will soon be lifted and shifted and will eventually be replaced by a "state of the art ecological learning centre entry way." A concrete foundation for the new centre is expected to be poured sometime in the next month and the log cabin will continue to be used until the new centre is open. The latest round of construction at the 240-acre property, located about a half-hour southwest of the city, is part of a total of $13 million that was approved in the provincial government's 2014 capital plan. Even though the funding for the front-of-house revamp is totally separate from the $25 million gifted to the University of Alberta by the Aga Khan in April to build North America’s largest Islamic-inspired garden, the renovations are in a large part needed to accommodate the expected ground swell of interest to the gardens. The Mughal garden, which will cover almost 12 acres of the site, is expected to double the amount of visitors to 160,000 people from 80,000 per year. Foote added that all the exterior work is expected to be complete by the time the garden opens in time for the Aga Khan’s diamond jubilee celebrations in July 2018. The Aga Khan is the hereditary Imam or spiritual leader of the Shia Ismaili Muslims.